The Markham Waxers were sold by Don Bremner of Restoration Environmental Contractors June 17, 2005. Click here to access their new home. MAKE THE WAXERS YOUR HOMEPAGE - CLICK HERE! JOIN THE WAXERS E-MAIL NEWSLETTER LIST - CLICK HERE! WAXERS' ALUMNUS OFF TO MEMORIAL CUP! Waxers Alumnus Anthony Guadagnolo and the Ottawa 67s have advanced to both the OHL Finals and the Memorial Cup with a sweep of the Peterborough Petes and Darryl Flowers. This is the 2nd time in 3 years that a Waxer Alumnus has been part of the Memorial Cup, the last being Jesse Boucher (part of the victorious Kitchener squad in 2003). Follow the Memorial Cup here. The Markham Waxers are excited to announce the commitment of a third player, our first 1989 born player, for the upcoming season. Matthew Meszaros, from the Red Wings Minor Midgets, is a big left winger who was the 4th Round Draft Selection of the Kitchener Rangers of the OHL. The Waxers Jr A would like to offer our deepest condolences to Alumnus Kevin Cribari and his family. Kevin's father Dennis passed away on May 12 after a short battle with cancer. Friends will be received at the Dixon-Garland Funeral Home (199 Main St N, Markham) on Sunday May 15 from 2-4 pm and 7-9 pm. There will be a Service held May 16th at 11:00 am. Our thoughts and prayers go out to Kevin, his mother Annie, and his sisters Jennifer and Karen. The Waxers Jr A team are pleased to announce the NCAA commitments of two more forwards, effective September 2005. Team Captain and Graduate Derrell Levy will be spending the next four years playing for Oswego State in upstate New York. Levy will join the Lakers and play in the NCAA SUNYAC League. During those four years, he will get to see more of centreman Riley Hill, only this time as opponents. Hill is off to Plattsburgh State, also a part of the SUNYAC, to play for the Cardinals. 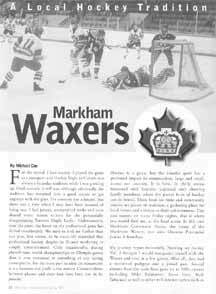 Read the inspirational insight on the Markham Waxers, in this article written in the spring 2005 edition of the Main Street News. You can also download the article by clicking here or on picture on right. Waxers Alumnus Anthony Guadagnolo and the Ottawa 67s have advanced to both the OHL Finals and the Memorial Cup with a sweep of the Peterborough Petes and Darryl Flowers. Follow the OHL playoffs here. Interested in becoming a Partner or Sponsor? Click here to send an email..